A lot has happened since June 2015. Some happy things and some sad things. Some not good things, some so good things. And not a lot has happened since June 2015 too. Let’s see if I can explain in as few words as possible. Health issues were found and taken care of, cyber knife, modern science is wonderful. We lost two elder family members, Aunt Sheryl and John’s Dad, a.k.a Pop, GrandPop and/or Jack. As is with life, we were blessed with new family members also. Two new nieces and our own family was blessed with the first member of the next generation, a boy to carry on the Gordon name. I haven’t done any sewing; my hands are not cooperating. However, I have gotten a few UFOs finished and I’ll post a few pictures later. Sadly, my creativity has taken a long vacation. 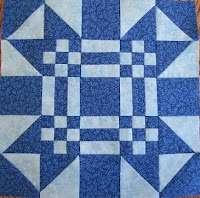 I still appreciate the beauty of quilts, but I guess since I can’t make any, I have no mojo to create any new designs. Thanks for asking about me, I will try to stay in touch. I always wanted to make a Missouri Puzzle quilt, so I made it a mystery and made a sample and now it's the BOM for June. 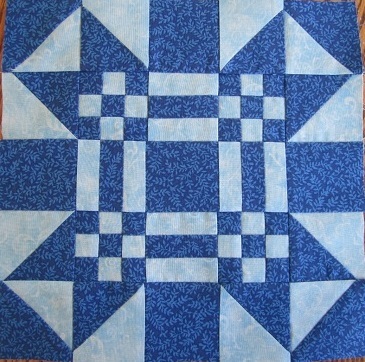 The quilt is finished and ready to go to the quilter, I’ll share a picture of it when it’s finished. Here’s just one block. 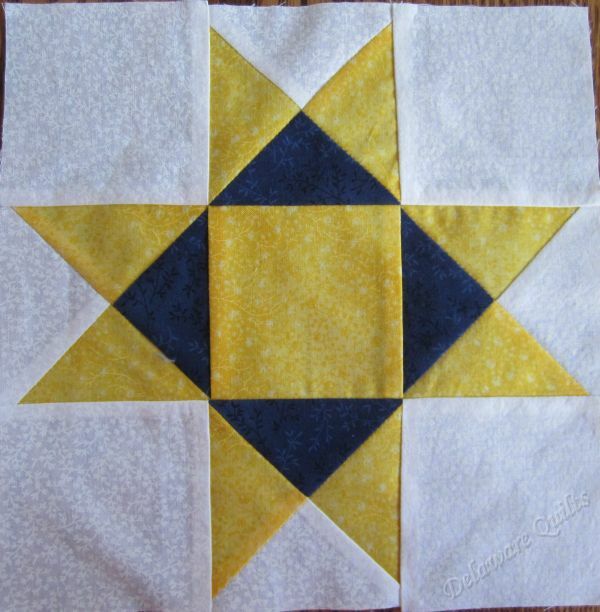 A new BOM for May, another Pinwheel Star block. Directions can be found here. Photos of both the Angels and the Spring retreats are now on line. Enjoy! 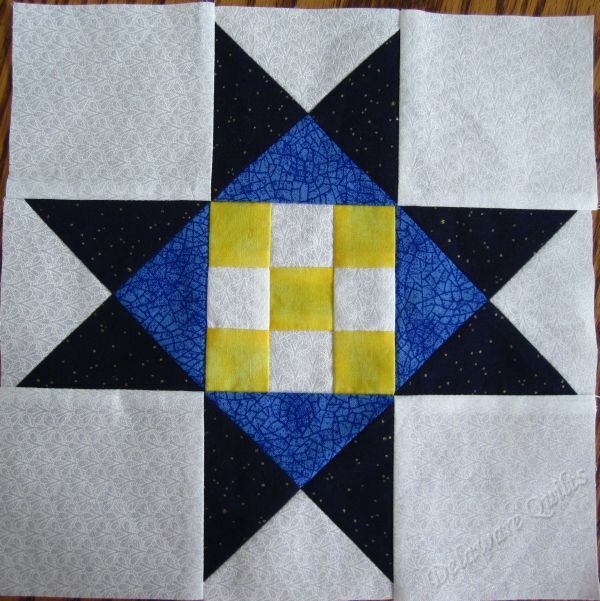 The new block for April is the Star of Hope. It’s another block with many names, but I liked Star of Hope the most. Directions are here. and an updated Ohio Star Variation. The spring retreats are just a little over month away now, let’s home spring has showed up by then. PS - I am sewing, but they are all top secret projects. I actually started and completely finished two gifts in February, and started and finished a new mystery top also. And I finished one UFO. 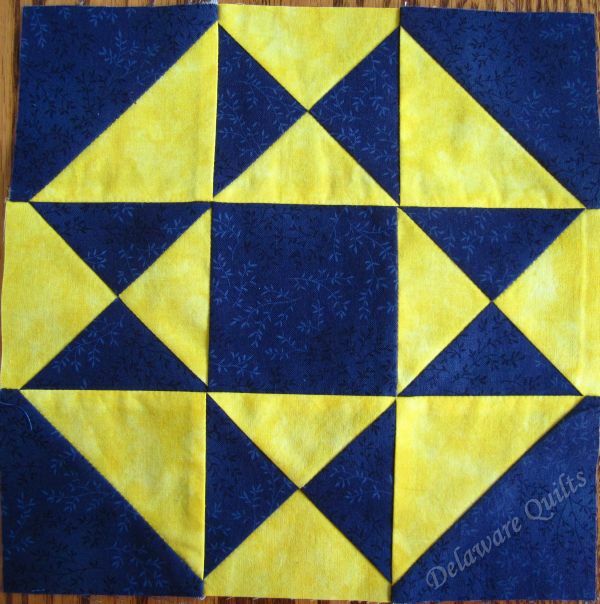 Plus I made quite a few BOMs for my BOM sampler, and I even made a few squares for my postage stamp quilt! Today is Super Bowl Sunday and the Mysteries For Relay group just got the final clue for the latest mystery. If you would like to join us and get this pattern and a new mystery every six weeks or so, all you have to do it make a $30 donation on my Relay page. (Anyone joining in February will get the latest mystery as a free pattern.) Go to https://groups.yahoo.com/neo/groups/MysteriesForRelay/info for more information. Sometime last year I decided I wanted to make ALL of the blocks I have on the BOM page. There are over 125 blocks listed and more in the works, a lot of blocks. 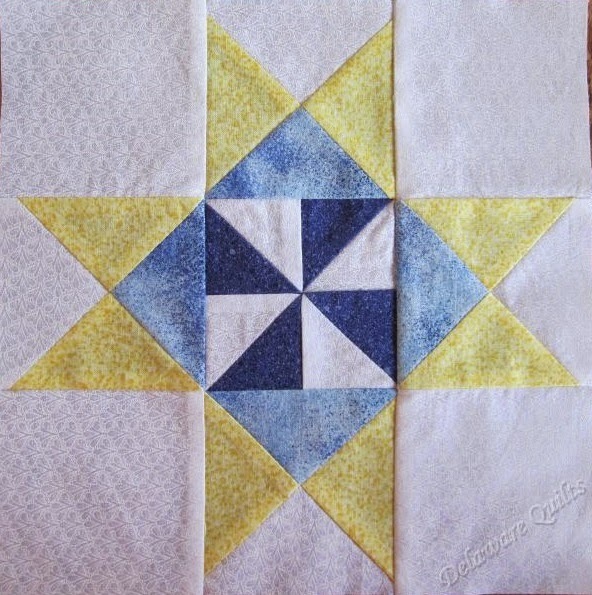 I decided to make my samples 9 inch blocks, and use a variety of blues, yellows and white-on-whites. What I’m going to do with all the blocks I’m not sure, no real plans yet, but I can report that I have 50 finished and several more already cut waiting to be sewn. Here are the updates for January 2015. 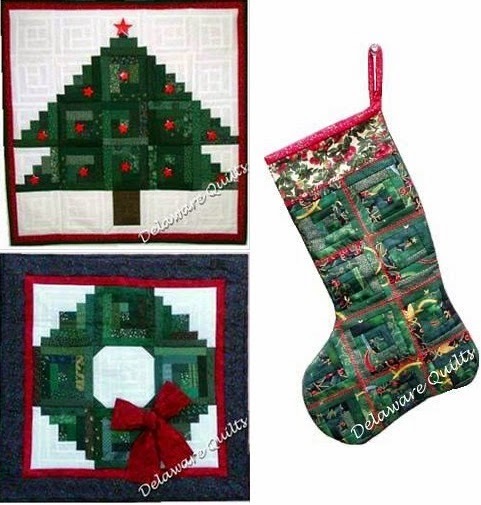 The BOM index http://www.delawarequilts.com/BOMs has been updated with two new blocks and two others which were updated adding more sizes to choose from. The Retreat page has been updated http://www.delawarequilts.com/Retreat announcing the openings in the 2015 Spring and November retreats. Wishing you all a happy and healthy 2015 and wishes for lots of time to make lots of quilts! I’ve had them before, but usually had a reason, illness, vacation, moving etc… This time I just don’t have any inspiration. I have BOMs to do, and I have new patterns to write and make and I have zero willingness to even walk into the sewing room. I’ve tried, for the last week I’ve tried to make myself do something….. but that’s all I’ve done. I think I’ll go read a new book. Happy Hanukkah, Happy Kwanzaa, and Happy Christmas too! Quite a few friends have asked what’s wrong, are you OK, and one friend wanted to know if I’ve been on vacation since October. I’ve decided it’s time I reply honestly so you will stop worrying about me. I had two enjoyable but stressful weeks of retreating in October/November. It was only stressful to me and I wasn’t real sure why. The conference room was bothering me for the first time ever for one thing. See I have claustrophobia and have for years, but thought I’d beat it. However I found it was gradually creeping back and more and more things were bothering me. Because the conference room has no windows I'd tricked my mind into believing there was a huge picture window behind me as I sewed. For some reason it wasn’t working this year and between that and all the normal chatter and noises, I was more and more uncomfortable. Some of you noticed I wasn’t joining in the group meals and was keeping to myself a lot. I already had an appointment with my family Doctor when I got home, and he noticed something was bothering me. (OK, I broke down while waiting for him in the examining room so it was hard not to notice.) We had a good talk and he put me on some new meds. If you know me you know I hate taking medicines. Adding another one to my already too many was stressful in itself. But that I needed it was even worse. And I realized that I did really need it when my house filled up with eight extra people on Thanksgiving. All that “company” even though it was all family was just too much for me. And we had this planned vacation to Disney, the most magical and crowded place I can think of. I wasn’t sure how it would go and well… it went so so. I had a panic attack the first day, and prepared myself mentally for the rest of the week, and I made it through with some anxiety and a lot of encouragement from my dear sweet John. In the end I can say I had a delightful but chilly trip but boy am I glad to be home. Please understand I am fighting this, but it’s going to take a while. Just don’t crowd me and don’t push me into something I am uncomfortable with. I’ll be OK.
First I was going to take this, then I decided to take that, then I decided to take them both of I could get them in the same container and now I want them both if they fit or not… I’m sure everyone goes through these decisions when heading on retreat. And I took a serious look at my “stuff”. If I was not the host of these retreats I would be taking my sewing machine bag which has all my sewing/cutting/measuring tools in it, a project bag with things to do, and a suitcase. When I fill my car tomorrow it will be full, barely any empty space, and a friend is bringing up three totes for me. What could I leave home? That is the question of the century! Not leaving for a few more days but I think I am almost ready. I have all the sewing stuff ready and all the retreat stuff ready. I just need the “me stuff” like clothes etc. I think I will get it all done. Now I just need to figure out how to get it all up there… that may be a problem! You would think after 18 years and 49 retreats I would have this routine down by now, but that’s far from so. And I’m not real sure why, but this fall I seem more disorganized than ever. I can’t decide what projects to take, I can’t decide what clothes either… will it be hot or cold? I know… layers, t-shirts and sweaters. And a jacket, I always forget a jacket if it’s a warm day when I leave home. But ready or not, it’s almost time and I need to start packing up the many piles I’ve made on the back porch and start getting ready… the way I’m going that’s what I’ll be doing all week long! Yesterday we worked in the yard because the weatherman said it was likely to be our last warm day of the year. We still have a half a bucket of tulip bulbs to plant. We went out and decided where we wanted the tulip bed to be, in a circle around my thorn bush. Just deciding where was probably the hardest part… we thought. John got the tiller from the shed, brought it to the front yard and tried to start it, and tried to start it, and tried to start it. And that’s all we got done. Well not quite true. 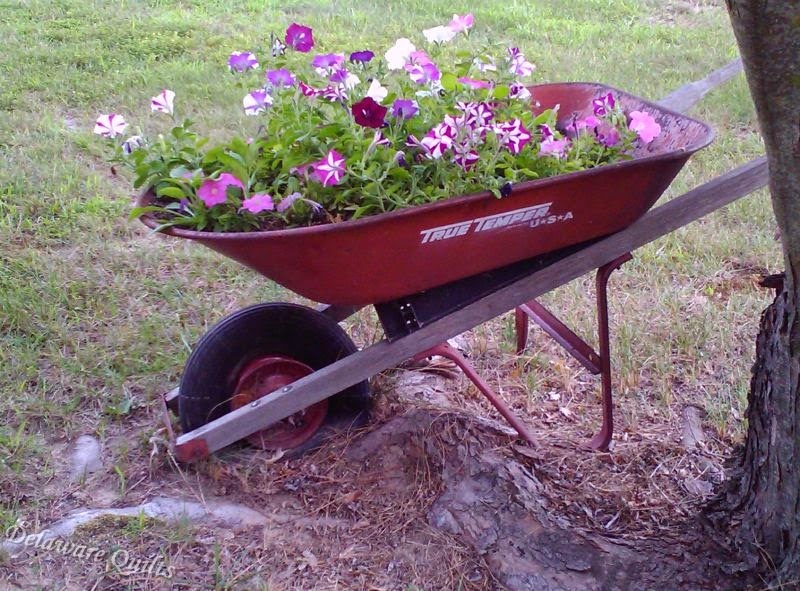 While he was trying to start the tiller I dumped a bag of potting soil in to the old wheelbarrow that sits under a tree in the front yard, kind of our country decoration. In the summer it’s filled with petunias and I decided it needed crocus for the spring. I stuck a whole bunch of crocus bulbs in there and now just have to wait for spring to see if they come up… will be a while before I can show it. PS, glad we did go out yesterday, quite chilly today! I can’t say finished because nothing new is, but I’m working on things. I’m more packed than I was the other day and all the patterns are printed. I planted another 500 and some bulbs this morning, mostly because I was up early, it was cool, and it’s going to rain which will cover all the holes I made. Now I’m going to spend the rest of the day (maybe) in the sewing room cutting strips and squares. I cut more 3 inch squares yesterday and got a start on my own 2 1/2 inch strips, but I still have a long way to go on both. No, I don’t think I’ll have any finishes to brag about for a while, but I’m making progress.